All it takes is one look at the Alfa Romeo 4C Coupe to realize that Alfa Romeo has perfected the art of seduction. From the irresistible exterior to its unwavering functionality, the 4C is unmistakably an Italian sports car like you’ve never seen before. As a two-seater, the 4C is small and extremely lightweight, giving it the ability to reach incredibly high speeds in a matter of seconds. Though with its sharp handling and responsiveness, this coupe makes any driver radiate confidence. While designed for the Virginia roads, the 4C is ready to hit the track at a moment’s notice. As soon as you sit behind the wheel of the 4C, you’ll quickly realize that its exterior beauty continues all the way to its core. Put your foot on the pedal, and you’ll immediately be overcome with a sense of exhilaration. Safford Alfa Romeo of Tysons Corner believes everyone should experience this, and our friendly product specialists are ready to let you step inside for a drive in this Italian-crafted masterpiece. After nearly two decades, Alfa Romeo re-entered the U.S automotive market in 2015 with an all-new model, the Alfa Romeo 4C, inspired by the 1967 Tipo 33 Stradale. While years earlier Alfa Romeo debuted the 8C Competizione, it was a low-production model with limited availability. Since being in production, the 4C has gracefully combined power and Italian design to separate itself from other competitors in the sports car segment. Built at Maserati’s Modena, Italy assembly plant and requiring six full weeks to complete, the 4C comes precisely crafted to provide an exciting, heart-pounding driving experience. Despite its short history, the 4C carries the spirit and passion of the century old Italian Alfa Romeo brand. Carrying on the race-inspired performance that the Alfa Romeo brand symbolizes, the 4C provides a passion-fueled driving experience to anyone that find themselves behind the wheel. 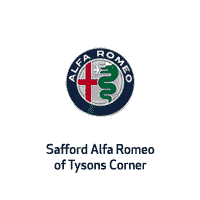 Fortunately, Safford Alfa Romeo of Tysons Corner is a short drive for residents around Washington DC and Northern Virginia, and we have the largest selection of Alfa Romeo models in the area. Along with providing you with an unmatched selection, our Finance Team strives to help every driver that comes in secure the car of their dreams. We’ve been assisting drivers throughout Washington DC get into the vehicle of their choice for many years, and we will work to get you the best rates and terms possible. Our commitment to you doesn’t stop there. Our Alfa Romeo Service and Maintenance Center will help you keep your vehicle performing its best for years to come. We aim to provide quick, convenient and quality service to fit your busy lifestyle and get you back on the road in no time. We even offer OEM accessories and performance parts so that you can customize your Alfa Romeo however you desire. Visit our Vienna, VA Alfa Romeo dealership today. As soon as you set foot in our studio, you’ll be overcome by the century of race history, passion and design that makes up the Alfa Romeo brand. Our friendly staff will go over every aspect of the 4C, answer any questions you may have and get you behind the wheel for a drive you won’t soon forget.